Another Big Quake Strikes Japan's Coast A tsunami warning was briefly issued after the 7.1 magnitude temblor struck off the coast of Miyagi prefecture — a coastal area that was torn apart by the deadly quake and tsunami last month. 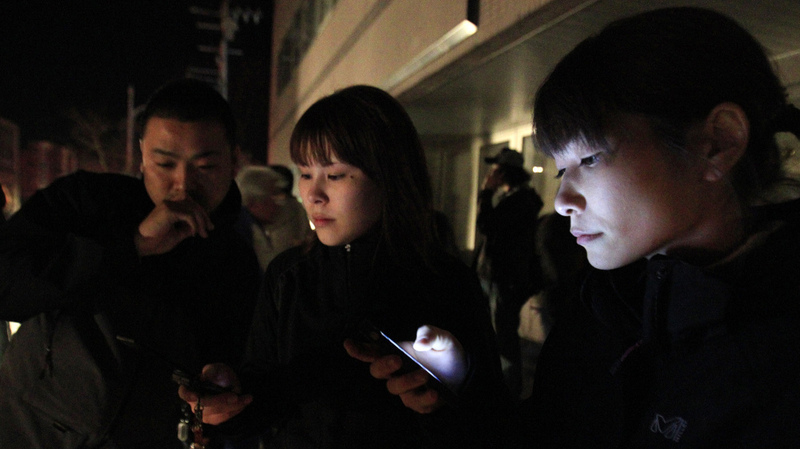 Hotel guests in Ichinoseki, Iwate prefecture, checked their mobile phones for news after they ran outside following a major earthquake that hit Japan on Thursday night. A strong aftershock ripped through northeastern Japan, killing two, injuring dozens and piling misery on a region still buried under the rubble of last month's devastating tsunami. The quake late Thursday was the strongest tremor since the March 11 jumbo and did some damage, but it appeared to have spared the area's nuclear power plants. The Fukushima Dai-ichi complex, where workers have been frantically trying to cool overheated reactors since they lost cooling systems last month reported no new abnormalities. Other facilities switched to diesel generators after the 7.1-magnitude quake knocked out power to much of the area. Many people in the area have lived without water and electricity for nearly a month, and the latest tremor sunk more homes into blackness: In total, around 3.6 million households, about 60 percent of residents in the area, were dark Friday, said Souta Nozu, a spokesman for Tohoku-Electric Power Co., which serves northern Japan. Japan's meteorological agency issued a tsunami warning but lifted all alerts less than two hours later. The warning had been issued for a coastal area torn apart by the March 11 disasters that killed thousands of people and sparked an ongoing crisis at a nuclear power plant. Officials said three northern prefectures and parts of two others had lost power. Thursday's earthquake had a preliminary magnitude of at least 7.1, according to the U.S. Geological Survey. It hit off the coast of Miyagi prefecture at a depth of about 30 miles. Two people were killed, fire department spokesman Junichi Sawada reported Friday. A 79-year-old man died of shock and a woman in her 60s was killed when power was cut to her oxygen tank. More than 130 people were injured, according to the national police agency. The quake that preceded last month's tsunami was a 9.0 magnitude. The quake struck at 11:32 p.m. local time. Japanese TV flashed a warning about an impending quake moments before it struck. In Tokyo's western suburbs, loudspeakers warned residents. Parts of Tokyo "shook for about two minutes," NPR's Greg Dixon reported, even though the quake epicenter was more than 200 miles away. He said there were no immediate reports of damage. In Ichinoseki, inland from Japan's eastern coast, buildings shook violently, knocking items from shelves and toppling furniture, but there was no heavy damage to the buildings themselves. Immediately after the quake, all power was cut. The city went dark, but cars drove around normally and people assembled in the streets despite the late hour. NPR's John Burnett said he was in bed on the 32nd floor of a hotel in Sendai, about 40 miles from the epicenter, when the building began to shake. "It started shaking back and forth tremendously, and the hangers in the closet made quite a racket and then the hotel alarm system went on," Burnett said. "We heard the voice of someone on the PA saying that the elevators were down." NHK also was reporting that the earthquake hit the Tohoku region in northern Japan — the same region that was devastated by the March earthquake and tsunami. Hundreds of aftershocks have shaken the northeast region since last month's temblor, but few have been stronger than 7.0. With reporting from NPR's Greg Dixon in Tokyo and John Burnett in Sendai, Japan. Material from The Associated Press was used in this story.